A castle's defenses are many and varied. You've got thick wall to keep enemies out. Tall towers from which you can rain arrows down on opponents. A sturdy portcullis so foes don't just waltz in through the front door. And there's the moat, a watery defense that reminds knights that heavy plate armor makes it hard to swim. But what could be lurking in those waters also looking to help defend the castle? That's what you can find out in Moat Monsters, a new sourcebook available from Skirmisher Publishing. In most fantasy settings, castles and cities are vital components of civilization, and many of these rely on moats for defense. These large ditches are usually filled with water and meant to stop attackers from reaching the outer walls. Although this tactic was successful in real world history, traditional moats are not as effective in fantasy worlds because of the existence of magic. To counter this and thwart fantasy-world invaders, moats could be filled with different materials and energies, or even populated with monsters. 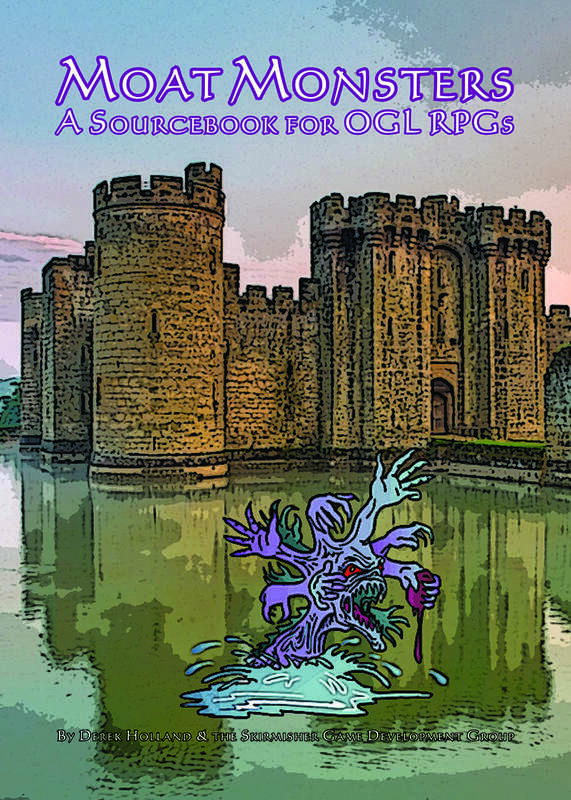 This sourcebook contains 20 monsters specifically designed to be ideal for occupying moats and enhancing their natural functions, along with ideas on other ways moats can be made more lethal first lines of defense for fortifications. Monsters in it are stat'ed for the "Basic" OGL system and can be easily adapted or used as-is with any RPGs based on or derived from it.